We are all aware that our beloved Church is going through a difficult time. The Venerable Father Michael McGivney Honoris is initiating prayer for our Church and its members. Please take a moment to reflect on what you may do to help. Be it saying the rosary if you have not been in the habit. Saying the St. Michael prayer as suggested by our Archbishop. and hard working parish priest. Father McGivney, founder of the Knights of Columbus, you prayed for unity in the Body of Christ - that we may be united as Christ is united with the Father. Give us, your children the desire to love one another, as you taught people during your time - for by this, we can be part of prayers for healing within all of our Church. Heavenly Father, how it must grieve Your Son that we have caused such barriers and divisions to be established within the Body of Christ and yet it was His prayer that we are one in unity of spirit - one in the bond of peace - one in fellowship and love towards all those that are called by Your name. Father McGivney, help us Catholics, find a hunger to live in union with each other, and may we be united as one, in the bond of peace and fellowship, with the Holy Spirit. Father McGivney, help us remember and ask for strength in prayers to St. Michael to protect our Church, May we follow the lessons given to us by our Blessed Lady to find fellowship and love towards all those called to our Holy Church. Heavenly Father, You are the author of life and source of grace. Without You, we are nothing, and with You, all things are possible. Guide us that we may humbly serve your people. Bless us with your grace that the work of the Knights of Columbus will make a difference in this small part of the world you have entrusted to us. We ask this in the name of Jesus Christ, Your son our Lord, who lives and reigns with You, in union with the Holy Spirit, as one God forever and ever. Amen. Lord Jesus you came into the world to heal our infirmities and to endure our sufferings. You went about healing all and bringing comfort to those in pain and need. We come before you now in this time of illness asking that you may be the source of our strength in body, courage in spirit and patience in pain. May we join ourselves more closely to you on the Cross and in your suffering that through them we may draw our patience and hope. Assist us and restore us to health so that united more closely to our family, the Church, we may give praise and honor to your name. Amen. From the Knights of Columbus, Book of Prayers for the Family 2748, with permission. Venerable Father McGivney, understanding your priestly virtue and pastoral concern for the poor, the orphan, the widow, for the protection of the faith of people, I come to you and ask for your efforts with our Heavenly Father for healing and understanding of what God's plan for us is. As I pray to God for healing and guidance, I do so in the remembrance of your priestly ministry, the example of your courage in times of illness and your understanding of God's Holy will. pray for your intersection for my healing and of your Holy Grace. 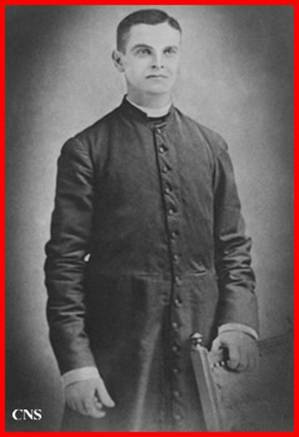 Venerable Father Michael J. McGivney pray for us. O Holy Trinity, we thank you for having given to the Church Pope John Paul II and for having made him shine with your fatherly tenderness, the glory of the Cross of Christ and the Spirit of love for the Knights of Columbus. He, trusting completely in your infinite mercy and in the maternal intercession of Mary, has shown himself in the likeness of Jesus the Good Shepherd and has pointed out to his holiness as the path to reach eternal communion with You. Grant, through his intercession according to your holy will, the grace that Ontario Knights of Columbus implore, in the thanks that he Is among your saints. In the vision of Father McGivney and in the company of all who are here we come to present this charter. May it come to be that this charter be known as a symbol of the efforts of the founders of this council and for the everlasting promise of all members of the Knights of Columbus to work with the Holy Catholic church and may their hard work be rewarded with a long history and continued growth, and be a start point to mark of many long years of service. May it come to be that this charter be known as a symbol of the continued relationship with this church, this council, the council's charter members and their families and for brothers who will join this council and their families. May it come to be that this charter be known as a symbol of the commitment of this council to strive for success within the programs of the councils and of the order. May it come to be that this charter is known as a statement of the support that this council has from the Supreme and State council and of their officers who promise to assist the council in any way that it can. May it come to be that this charter is a sign that a State District Deputy is committed to your council and will do all he can to foster understanding of our order. May it come to be that this charter will remind the council's executive of their roles and duties and responsibilities. May it come to be that this council was blessed with the hope that God will grant his grace to each and everyone. Venerable Father McGivney, we ask you to fill us with the knowledge of all wisdom and spiritual understanding. Help us to walk worthy and fully as Catholics before our God. As an order, help us to be fruitful in every good work and to increase in knowledge of what you wished for us to do. Teach us how to live together in unity. Walk us through the steps of rebuilding loving fellowship between us. Father McGivney, help us to continue to obey God's command to "love our neighbor as ourselves" so that we will not self-destruct by backbiting and devouring one another. Show our leaders how to mend the broken relationships and restore balance to our order and understanding of our principles. Father, please strengthen us and help us to represent the Kingdom on earth by our actions and deads. Please empower us to give of our talents, gifts, and resources to manifest change in our city and advance our order and our members. Father McGivney may we follow your example and forgive us for holding onto grudges and for seeking vengeance upon our brothers and sisters in the Lord. Forgive us for leaning toward our own understanding and failing to acknowledge Christ in all our ways. Forgive those of us who have stood by passively allowing sin and deception to go unaddressed. Forgive us for not heeding the warnings of the Holy Spirit and being hesitant to obey God's commands. Help us to release past and present offenses and to be willing to forgive one another just as God has forgiven us. Father McGivney, may our order grow and may each of our brothers and family benefit from our actions and prayers.